I have been planning a new qualitative research project, and reading draft proposals and draft methodology chapters for students I am coaching, so I have been thinking about qualitative data lately; particularly how to get the right kinds of data from participants when we are conducting interviews. There are three main forms of interview that are discussed in methodology texts and guides: structured, semi-structured and unstructured. Generally, when embarking on a qualitative project, students tend to opt for semi-structured interviews. This enables them to have a set series of questions, hopefully well connected to their theory and literature, but also to create space for participants, or interviewees, to add views and insights that may not strictly follow the questions. It’s sort of a best-of-both-worlds scenario. Unstructured interviews are hard to manage, especially for postgraduate students, many of who are doing this form of fieldwork for the first time. And fully structured interviews can veer into not allowing any space for additional, unpredicted insights and information – they can, in other words, limit the conversation, and also the kind of data collected. *Caveat: you do need to choose the right tool for your project, regardless of whether it is hard to do or not. But, semi-structured interviews, while they seem to be a dominant preference for many students doing qualitative research via interviews, are not easy to do well. A key issue I am thinking about in relation to my new project, and that I assist other researchers with, is this: how do I conduct the actual interview so that I get the data I really need? What tools or techniques so I need to be aware of? I have listed a few points here that have helped me, and that are also the product of my own mistakes and learning in conducting qualitative interviews. The point of the first interview is to get a second interview. I didn’t know this during my own PhD, which was also my first major research project. I did one set of interviews, and I do recall, on reading the transcripts, wishing that I could go back and ask some of the questions differently or find out more about specific issues. But I didn’t really know I could (and I didn’t plan for this so I ran out of time). But, now it makes complete sense. Unless you are interviewing someone you already know well, chances are you and the interviewee will be strangers to one another. Establishing a rapport, and trust, can take time – certainly more time than one interview allows for. So, you need to make the goal of the first interview establishing a connection that will enable you to go back, and talk to that person again. You may get the basic data you need in the first interview, but chances are that you will need more that interview #1 can yield. You will want richer, or deeper responses to some of the questions, or will see that certain questions could be asked differently, to yield slightly better, or more relevant, responses considering your research questions and aims. Plan enough time for at least two interviews, and ensure that you check with the interviewee that you could approach them again if needed. Listen to the recording of the interview as soon as you can, then, make notes, and think about what the data is saying in relation to those research questions. Then work out whether you have enough of the rights kinds of data to include in your analysis, where any gaps are, and plan interview #2 accordingly. Record your interviews and take notes. You always want to audio-record the interviews, so that your transcription, analysis and reporting will be accurate, and rich. But, you also want to take notes – not so many that you are unable to maintain eye contact and engagement in the interview, but have a notebook and pen to record things that the audio may not capture. Perhaps body language is a factor to consider in terms of the kind of data you are generating – if participants appear nervous, or distracted, this may be something you want to consider in the analysis alongside their words. Perhaps what their words say, and what their body language says are two different things, and this could be important as a possible finding. Perhaps they mention names of other people you could consider interviewing as well, or names of websites, documents and other sources of information you need to follow up on. All of this can be captured in a few short notes, and can add to the richness of your overall findings and analysis later on. Plan for a pilot interview. This has been a big point of learning for me. I tend to get over-eager in interviews, and I just plain talk too much. I find myself listening to the audio and cringing, and wishing I could just be quiet, and let the interviewee talk! There are two benefits, here, to a pilot interview: the first is that you can practise being an interviewer. You can work out how to record and take notes, how to talk less and listen more, how to direct and redirect the conversation as needed, and how to manage your own facial expressions and body language, to remain as neutral as possible so as not to bias or shift the interview in unhelpful directions (like looking shocked or disapproving at something an interviewee says to you). The second is that you can figure out whether the style you are using and questions you have as a guide are yielding the answers you need. Are there too many questions? Are some of the questions too long and ‘wordy’? Do any of the questions yield answers that seem a bit off topic, or that are repetitive? Make notes and adjust the interview plan before the real interviews begin. You need to do a pilot with someone who represents the interviewee demographic, and preferably with enough time to make changes and adjustments before you start meeting with the study’s group of participants. Plan for a conversation, rather than a Q&A session. This has been a really big point of learning for me. In a qualitative study, regardless of the topic, you need rich, detailed data. Qualitative research is about depth, rather than breadth, in simple terms. Thus, you need depth in the data, to achieve depth in your analysis, findings and conclusions. Thus, what you want to do with conducting the interview is create a conversational space, rather than a stiff, Q&A session where you ask a long list of questions, and the interviewee responds. The best way, I find, is to start off by asking the interviewees to tell me a story, related to the research I am doing and my interview questions. For example, if I am doing a project on postgraduate supervision, and my interviewees are students and supervisors, I don’t want to start off with something like: “Do you enjoy supervising students, and why or why not?” (Typical kind of question you find in interview schedules). This will not help me to get a richer sense of what the supervisor does as a supervisor, and what aspects they do and do not enjoy. So, what I could rather do is ask the question like this: “Can you start off by telling me a bit about your current supervision situation?” And then just listen. In that response, then, I listen for what aspects they seem to like, or not like, and in the follow up, I could ask: “You seem to find supervision a struggle, rather than a joy, right now. Would you say that is accurate? Could you say a bit more about that?” And then listen. And so on. So my questions become a guide, but not a determinant to the structure of the interview. The main thing in doing qualitative interviews, I am learning, is for an interviewer to have empathy. Trying to be in the moment, and create a sense for the interviewee that their stories are valuable, and worth sharing and hearing, enables the creation of a rapport that can lead to follow-on interviews, and that can encourage interviewees to see me as an ally, and someone who will share their stories responsibly, ethically and with care. This is crucial when you are working with people who trust you enough to give you truthful stories, experiences and accounts. Ultimately, you need to listen closely, and record accurately, so that what you share in your study is able to meaningfully shape knowledge, research and practice in your field. This is my last post about fieldwork. This final one is about observations, and whether and how to participate or not participate in what you are observing. In my case I was observing classroom teaching, but I think these comments could also apply to tutorials, meetings, workshops – any kind of encounter where there is an opportunity for you to be present, watching and taking notes, and in some cases also participating. I have read a little bit about participant and non-participant observations, and the relative pros and cons of each. I chose non-participant observation, and in the spirit of this blog, I want to add my own voice on what it was actually like to sit in lectures for 14 weeks and not participate very much at all, what eventually tipped me from being totally quiet to venturing a little participation, and why I think non-participant observation can be a challenge. I decided not to participate in the classes I was sitting in on for one big reason and a couple of smaller ones. The big reason was that I had majored in the one subject I was including in my study (Politics), and I have worked for 4 years with lecturers teaching the other particular course (Law) so I have come to know a fair bit about the knowledge and I find it very interesting. I was worried, in short, that if I participated I would ask too many questions or make comments that would in some way silence the voices of legitimate students or perhaps lead to the lecturer and I engaging in a conversation or debate in class that might exclude students. I have been in higher education as a student and tutor for a long time and these students are by-and-large in their first year of study. I felt I had no right, really, to come into their classroom and take up their time with their lecturers. One smaller reasons were that I thought I would be able to capture more accurate and objective fieldnotes if I was not too involved in the course. The more you participate, I reasoned, the more you perhaps want to agree with the lecturer, or the less you want to make a note of things that could be negative or less flattering, so your fieldnote data can be skewed or incomplete. I think that this ties in with my first post on fieldwork, where I talked about the Trowler and Williams’ articles on doing research in your ‘backyard’ and the possibility of finding out knowledge that can put you as a researcher in a tricky position in relation to your participants or your university/organisation. I felt that participating might tip my own personal scales in a too-subjective direction. I can’t here go into a full conversation about whether research like mine can be called fully objective (suffice to say it can’t be because there is always some researcher bias in qualitative studies like mine), but I will say that I was trying to record, as verbatim and as faithfully as possible everything that went on in the lectures without trying to pre-judge or pre-organise my data into categories or decide what had to stay and what could go, and I felt that being too involved in the lectures would hinder and further bias this process. Another smaller reason was a little more vain: I simply wanted to be invisible. I didn’t want to call attention to myself because after all my years of studying and teaching, I still get palpitations when I have to speak up in class or ask a question in a meeting where people will look at me. So I liked the quietness of non-participant observation, even though I had introduced myself to the whole class at the start of lectures and they knew who I was and why I was there. However, being that quiet, especially when I really had a question to ask or an answer to a question posed by the lecturer, was really difficult. 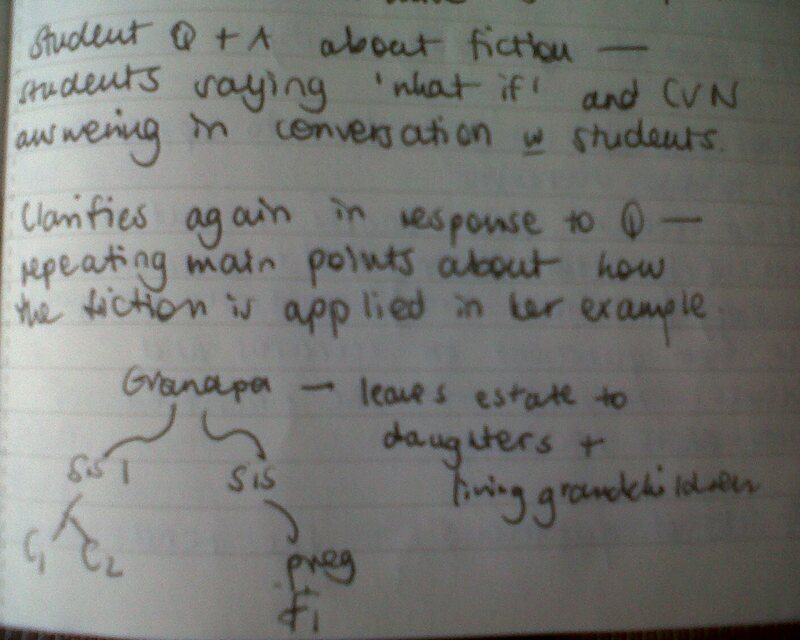 At times my notes record this frustration: ‘I really want to join in the discussion. So hard not to comment’. I felt, especially in Politics, that I had some useful thoughts to share, but I resisted the urge to call out answers because I felt it was unfair. I did this course when I was an undergrad so answering would have felt a bit like cheating on a test. Right at the end of both courses, though, I gave up resisting and I asked a couple of questions in Law lectures, and at least raised my hand to vote on issues in Politics although I did not ask questions there. I was nervous about doing that, but the lecturers included me as a student and did not offer any special treatment which allayed at least my worries about taking over a student space. This year, I am participating a little – as a very-semi-participant observer – in my post-doc data gathering. I am doing it partly to try out a different way of doing observations like this, and partly because I have learned that limited and careful participation does not necessarily lead to the issues I was concerned about, like skewing my data or distracting the lecturer or muscling in on students’ space. But I do think if you are going to be a participant observer you have to be careful and keep a record of your participation in your fieldnotes. You need at all times to be the researcher first and the participant second. You need to check with those you are observing if it is okay, and to what extent you could or should participate. It is in many ways easier and less fraught to stay silent in the background and just watch and make notes, but participating can be more fun even if it brings possible complications with it. It’s up to the researcher considering the situations in which data are being gathered to decide what will work best. Be pragmatic, take careful notes and be open, and don’t forget to tell your readers why you made the decisions you did when you get to your methodology chapter!